ENG) Hi there! Here's a Time Lapse video showing, in a hopefully entertaining way, the creative process of a 1 hour concept sketch. It's always fun to face an empty canvas with no previous planning and just see where your hand takes you (Carlos Huante talks a lot about this). Him and a tone of other artist whose Time Lapses and Tutorials I've devoured, are what motivated me to make this one of my own art, hoping that someone, somewhere, will enjoy watching it. 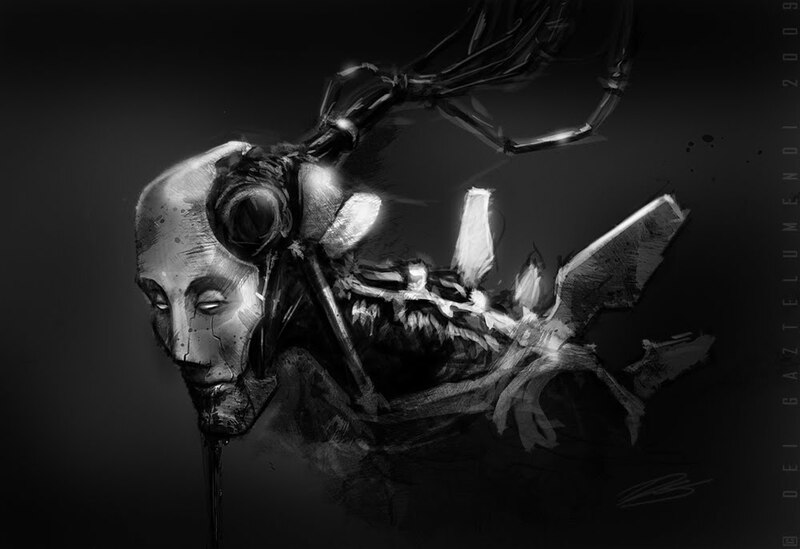 Bellow is the final Droid Sketch image. Please, as always, feel free to critique, ask, suggest... and help me improve. Thanks for stopping by! ESP) Iepa que pasa! Aqui os dejo un Time Lapse que muestra, de una manera entretenida espero, el proceso de creación de un boceto conceptual de 1 hora. Siempre es divertido enfrentarse a un lienzo en blanco sin ninguna planificación previa y ver a donde te lleva tu mano (Carlos Huante habla mucho sobre esto). El y otros artistas cuyos Time Lapses y Tutoriales he devorado, son los que me han motivado para hacer este con mi propio material, esperando que alguien, en algún lugar, vaya a disfrutar viéndolo. Abajo esta la imagen final del Boceto del Androide del vídeo. Como siempre, critica, pregunta y sugiere lo que sea tranquilamente... que de eso me alimento leñe! Gracias por haberte pasado por aquí. EUS) Goazen lagunok! Amets betean! Iepa, hementxe jartzeizuet egin berri dudan Time Lapse bat non 1 bateko bozeto kontzeptual baten sormen prozesua ikus daitekeen, modu entretenigarri batian espero dut. Dibertigarria da edonoiz mihise txuri bat erasotzea inongo aurre-planifikazio gabe eta eskuak nora eramaten zaituen ikustea (Carlos Huantek asko hitz egiten du honi buruz). Bera eta beste artista asko, zeintzuren Time Lapseak eta Tutorialak irentsi izan ditudan, haiek izan dira nire artelana erabiliaz halako video bat egitera animatu nautenak, norbaitek, nonbait gozatuko duela esperoz. Behean Errobot Marrazkiaren bukaturiko irudia ikus daiteke. Beti bezala, kritikatu, galdetu eta aholkatu lasai asko... eta hobetzen lagundu. Eskerrik asko bixitagatik! Very nice Dei! haha you sure like your glowing highlights. I quite like the texture, made some sound choices brush wise. I kinda get a comical image in my head of him standing on a bus, just need the one arm up holding the bar. Seems to match the usual "work-day commute" expression. Glowing highlights? What? lol, I think I'm addicted to those splatter brushes too. And yeah, he could probably use a coffee, haha. ABSOLUTELY AWSOME DESIGN AND DRAWING! haha nice song choice too this song has been getting bigger and bigger recently.